Sedona, lovingly referred to as Red Rock Country thanks to the colorful and striking red rock formations that are visible practically everywhere, is a hugely popular vacation destination that attracts adventure sports enthusiasts, nature lovers, and wildlife photographers. It’s also a prime location for hiking, whether you’re solo or with the entire family, a total beginner or an avid trekker. 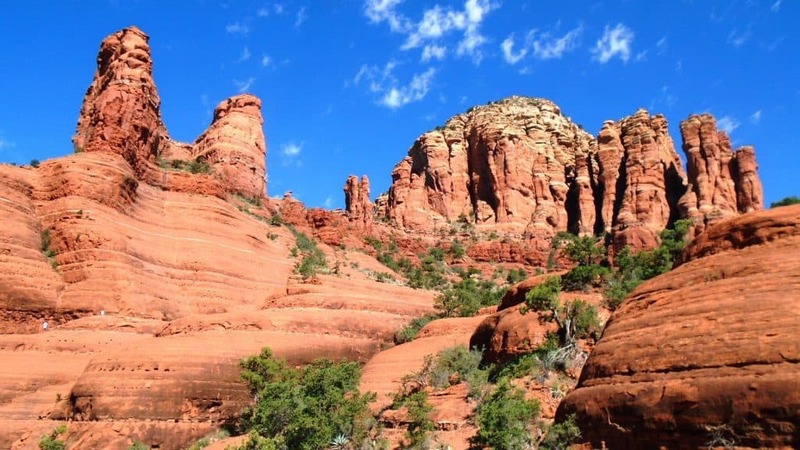 In this article, we’ll go over a number of fantastic hikes in Sedona, Arizona. For each one, we’ll tell you about the views and what to expect on the trails, and we’ll include the difficulty level, length, and location. As needed, we’ll also give you some hiking advice or define terms you may not be familiar with. 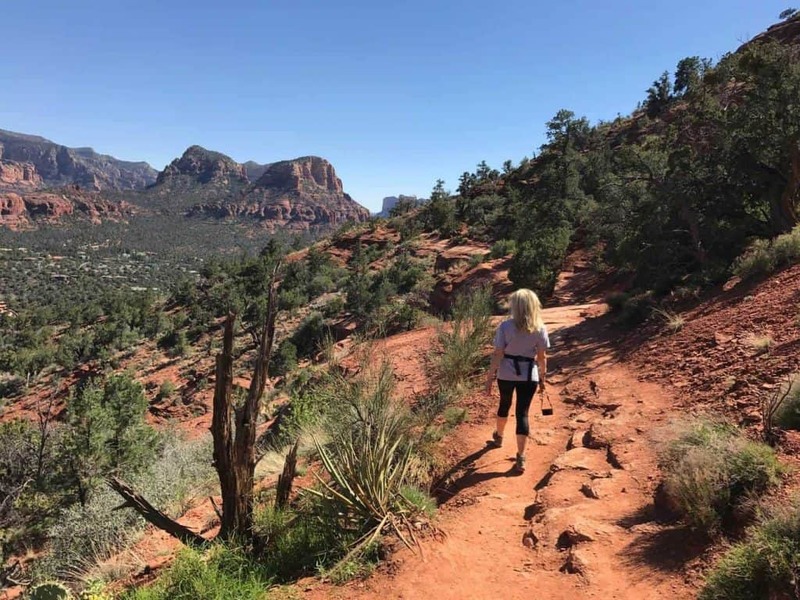 We’re also going to give you some must-know advice about hiking in Sedona, since this area of the country is prone to different sorts of topography and weather than you may be used to. In order to choose these hikes, we’ve compared several recent reviews from a variety of knowledgeable websites, specifically scouting for a range of difficulties and hikes with excellent views and/or unique features. We paid close attention to the hikes that popped up over and over again, yet we didn’t neglect the lesser-known trails that we feel our readers would love to know about. 2. Check the weather for storms before you go. 3. 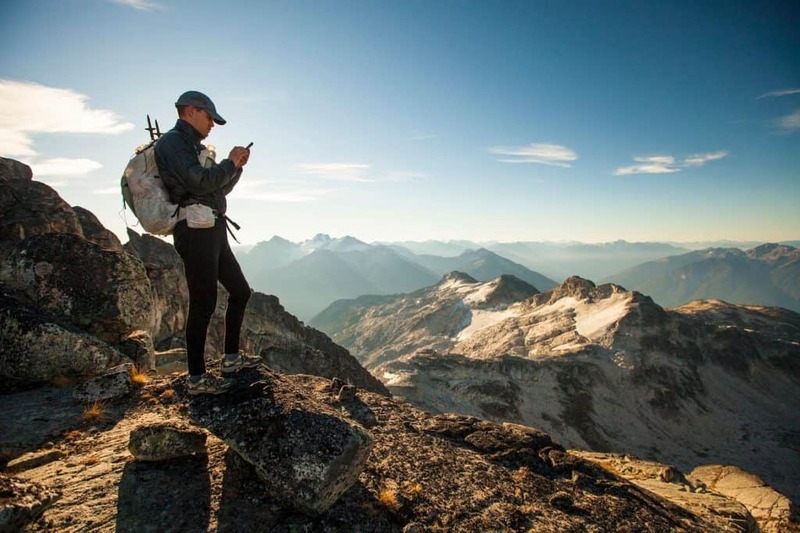 Choose the best time of day for your hike. 5. Let someone know where you’ll be. Airport Mesa is one of Sedona’s four hiking trails that’s also a vortex site. A vortex site is an area of concentrated energy that rises from the earth, and some people believe that it can be healing. If you’re looking for a spiritual hike, consider this one. Airport Mesa’s stunning scenery, with 360-degree views of the red rock formations, is perfect for taking photos or watching the sunset over the desert. You’ll also see pretty, flowering prickly pear cacti lining the trail. The hike starts out with some narrow and steep sections, so you may want to choose another hike if that sort of things scares you. Other than that, though, there are limited elevation changes. While this hike is a 3.5-mile loop, if you end up having to park in the overflow lot, you’ll need to take a short side trail first, adding 1.2 miles to the total length. This short-yet-steep hike ascends the northern face of Bell Rock. The trail is fairly well-marked with cairns (a cairn is a mound of rocks or stones that serves as a landmark). About midway up, you’ll come upon a flat level, where you’ll have two paths to choose from. If you go to the right, you’ll walk around Bell Rock to see views from the southwest. Note that this path does not lead to the summit. If you go to the left, you’ll use a path to take you higher up Bell Rock. There’s an option to go to the top of one of the spires (a part of the rock that tapers off), but you’ll need experience for this. For a longer, more advanced hike, add on the Courthouse Butte Loop. You’ll be treated to views along the way as you make your way around the bends. This hike is on the easy side, but it becomes more difficult when you climb the rock steps. There’s also a steep finish. This diverse, picturesque trail – another one of Sedona’s vortex sites – goes through a box canyon, which is a narrow canyon that’s flat on the bottom and has vertical walls. The elevation will vary as you go along, and, depending on the time of year, it’s possible you’ll even see snow in some areas. (Not sure what to wear for a hike like this? We have a helpful guide.) The assortment of trees boast gorgeous foliage during the fall, and local wildlife includes black bear and mountain lions. Cathedral Rock is an iconic and popular Sedona hike with excellent views at the end of the trail as your reward. The climb may be short, but it’s steep – you’ll need hiking boots instead of basic fitness sneakers. The first 300 feet are pretty flat, but then the hike becomes very steep, requiring you to use your hands to help you get up in some areas. Since the first part of the trail is exposed to the sun and without shade, make sure to wear sunblock, avoid overheating and drink plenty of water to stay hydrated. There will be more shade as you reach the upper part of the trail close to the rocks and the saddle points (gaps). Once you’ve reached the End of Trail sign, make a left to explore the area around the spires. Something that’s important to remember about steep hikes is that going down can be even more taxing on the body than going up, especially when it comes to the pressure put on your knees. Consider bringing along hiking poles to make the descent easier. If you’re not up for such an intense hike, drive to Oak Creek to park, then head out for the short, easy hike along the river. The trail is flat without any inclines or declines, and you’ll see a beautiful view of Cathedral Rock towering above. Cookstove is one of the lesser-known trails in Sedona, meaning it won’t be as overrun with hikers and tourists as some of the others on this list. This peaceful hike is easy to miss because the trailhead sign is on the small side. There’s a tap across the road from where you park your car – fill up your water bottle with natural spring water if you’re running low. Once on the trail, you’ll have gorgeous overlooks of the Oak Creek region, including the diverse Oak Creek Canyon area with colorful rock formations and thick, green forest. The climb is steep, though, and even though it’s less than one mile up, it’s not necessarily for beginners. 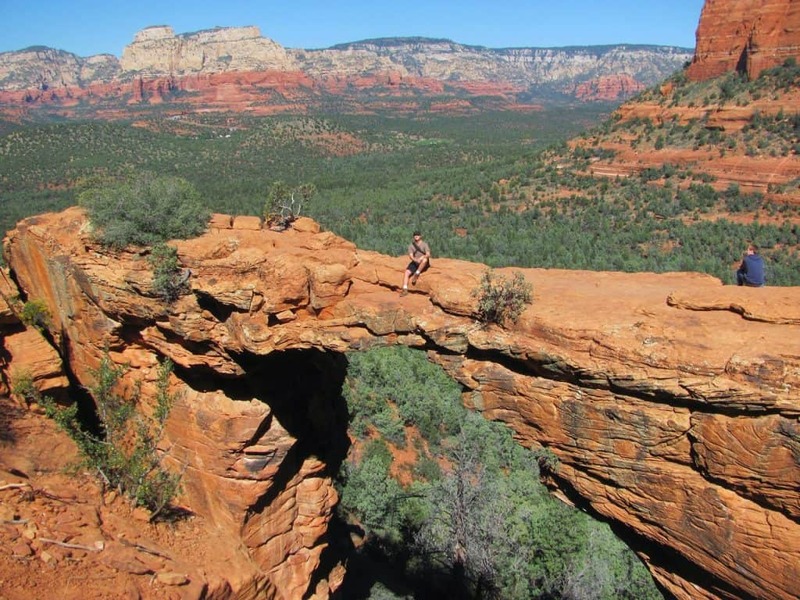 Devil’s Bridge is an excellent hike to do if you’re short on time. The views are lovely, and you’ll see one of Sedona’s largest natural sandstone arches, which you can walk across (assuming you’re not afraid of heights). The trail has a few steep inclines and requires a bit of scrambling to reach the arch. Scrambling is a mix between climbing and walking, requiring you to use your hands in order to make your way up. If you have a high clearance vehicle, you can park in the main parking lot. This parking lot gets full, though, so you may have to head to either the Long Canyon Road parking or the Dry Creek Vista trailhead. From the main parking lot, the hike is 2 miles round trip; from Long Canyon Road, it’s 4 miles round trip; and from the Dry Creek Vista trailhead, it’s 6 miles round trip. From the main parking lot, the hike to the arch is one mile. Three-quarters of the way, the trail will split. If you go to the right, you’ll head up to the top of the arch. If you go to the left, you’ll go under the arch. If it’s wet or icy, reconsider hiking up to the arch – there are natural stone steps along the way, which get slick, and there aren’t any handrails. Doe Mountain has beautiful views during the climb up and even better views at the summit. The trail has a series of switchbacks, which are sharp bends on the trail. Even though switchbacks can feel tedious, they often make a steep mountain a bit easier to handle. Once at the top, you’ll have a 360-degree view that looks upon some of Sedona’s biggest landmarks, like Bear Mountain, Wilson Mountain, Boynton Canyon and Secret Canyon. The trail is .7 miles each way, but if you have the energy, you can add on a self-guided tour of the mesa. 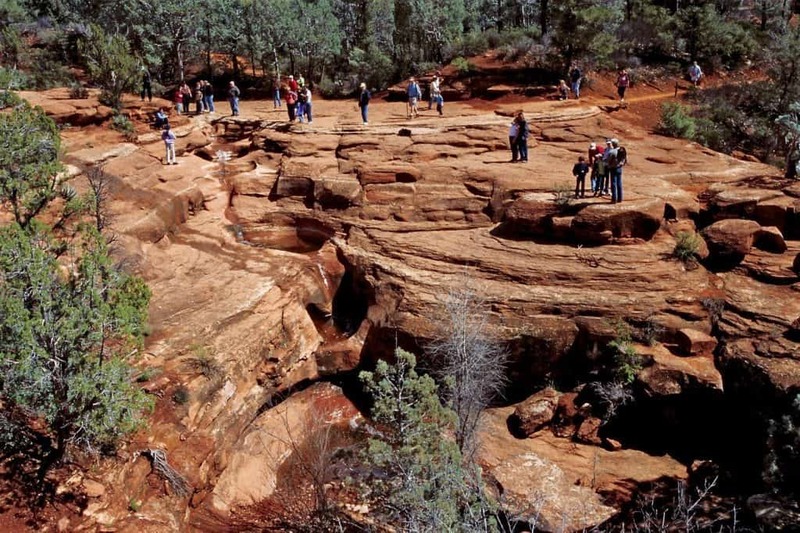 This well-marked trail in Red Rock State Park is family-friendly and one of Sedona’s most scenic hikes. Oak Creek runs right through the park, and you can learn about the landscape by taking a guided hike. The area is also popular for birdwatching. There’s a trek as short as half a mile, and the hike to the highest point is two miles long, but by connecting all of the trails, you’ll embark on a five-mile loop. Fay Canyon offers a short, low key trek with great views, leading you through the Red Rock Secret Mountain Wilderness. You’ll walk along mostly on dirt under a canopy of trees, and there’s an optional half-mile detour (slightly more challenging than the rest of the hike) if you want to head to a natural arch and even more fantastic views. If the side trail isn’t marked, look for a pile of rocks at the entrance. Whenever you go off a main trail on any hike, be extra attentive and careful. Side trails aren’t always marked or maintained, and if you don’t know what to look for or where you’re heading, you could easily get lost or put yourself in danger. This flat trail is excellent for hikers of all skill levels. The trailhead has a lot of parking, so you should be able to easily find a space. The hike should take you about two hours, leaving you plenty of time and energy afterwards to explore more of Sedona. The trail is well-marked and there’s great scenery along the way, including views of the Cathedral Rock and Courthouse Butte formations. At the end, you’ll see Chicken Point from a beautiful overlook. Red Rock Crossing leads to a view of Cathedral Rock. You’ll start in the paved parking lot, then follow the stream on the sidewalk. The path will turn into a dirt road that’s shaded by a tree canopy. The trail will eventually lead to a rocky opening as the stream curves with you, and you’ll be able to view the creek and Cathedral Rock. While this is an easy hike that doesn’t require hiking boots, it’s always best to wear supportive shoes on any hike. Even relatively flat hikes can have slippery dirt, and hiking boots will also protect your ankles if you lose your balance. It’s also important to break in your hiking boots, especially if you’re heading out for a difficult or long hike. Soldier Pass is one of Sedona’s most exciting and unique hikes. You’ll come upon a number of interesting features, like the Seven Sacred Pools, which are natural pools that have been carved from sandstone; three natural arches; and one of Sedona’s most active natural sinkholes, Devil’s Kitchen. There’s also a changing landscape that ranges from the leafy and shady wilderness to wide open vistas and views of the red rocks. Soldier Pass is located close to town and it’s an easy hike with no major climbing involved. It’s also quieter than some of Sedona’s more popular trails. Note that this trail isn’t very well-marked. There’s also limited parking at the trail, so you may want to arrive early to secure a spot. Also located close to town, this trail has great scenery and doesn’t require any steep climbing, though there are a few minor inclines. You’ll see stunning rock formations, including Coffeepot Rock – many of Sedona’s red rocks are named after what they resemble. See if you can make out the coffee spout and lid. The Teacup trail is easy enough for beginners, and the trail becomes moderately difficult if you add the Sugarloaf Summit climb. The Sugarloaf Summit Trail is steep for .2 miles and you’ll get a fabulous 360-degree view of the red rocks when you reach the top. This short hike is an excellent alternative to the main Cathedral Rock hike if you want scenic views without the challenge or height. This hike isn’t nearly as difficult as Cathedral Rock’s scramble, and you’ll still get views of Oak Creek. There also won’t be a lot of traffic, since most people head to the area specifically to hike Cathedral Rock. This hike is one of the longer ones on this list, but it’s easy and scenic, so it makes for a great day outside if you don’t want to exert yourself too much. You’ll be surrounded by greenery and wildlife, not to mention vistas of the red rock cliffs. 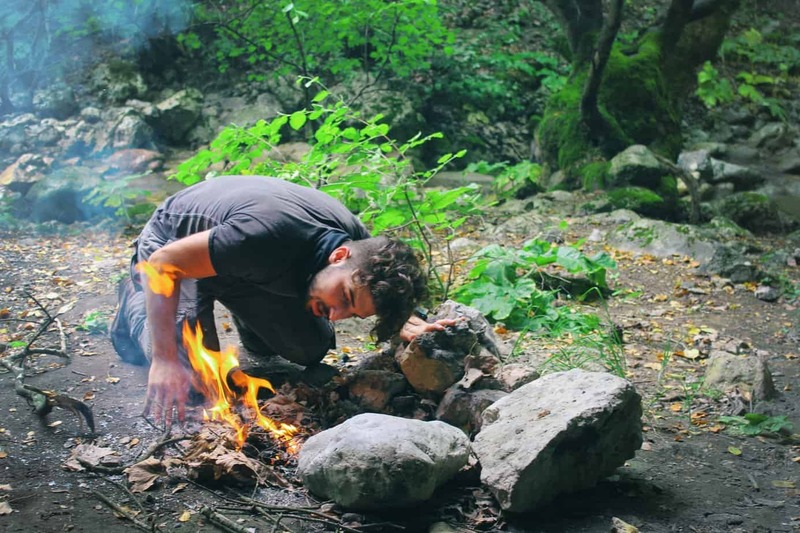 You’ll also cross a creek 12 times, and even though the water is just a couple of inches deep, make sure to wear water-resistant hiking shoes. You’ll also explore a bit of Old West history, like the ruins of Mayhew Cabin, which was built by Bear Howard in the 1870s. The story of Bear’s name is that he got it after killing four bears using just a knife. This short, shady hike starts at Midgley Bridge and travels along scenic trails that go through the Secret Mountain Wilderness. This trail is ideal if you want to check out fall foliage, and there’s also red rock scenery at the start and end of it. Since the parking lot fills up mid-morning, start as early as possible. The Palatki Heritage Site trails aren’t exactly hikes, but they are interesting jaunts that you’ll want to try to make time for. The easy walks will lead you through ancient ruins, and there are three trails in total. One of the trails takes you to the Sinagua cliff dwellings, another gives you a view of the dwellings, and the third brings you to an alcove with ancient paintings. It’s best to call ahead to book a guide so you can learn about the history of the area. Hiking in Sedona may be a lot different from where you’re used to hitting the trail. 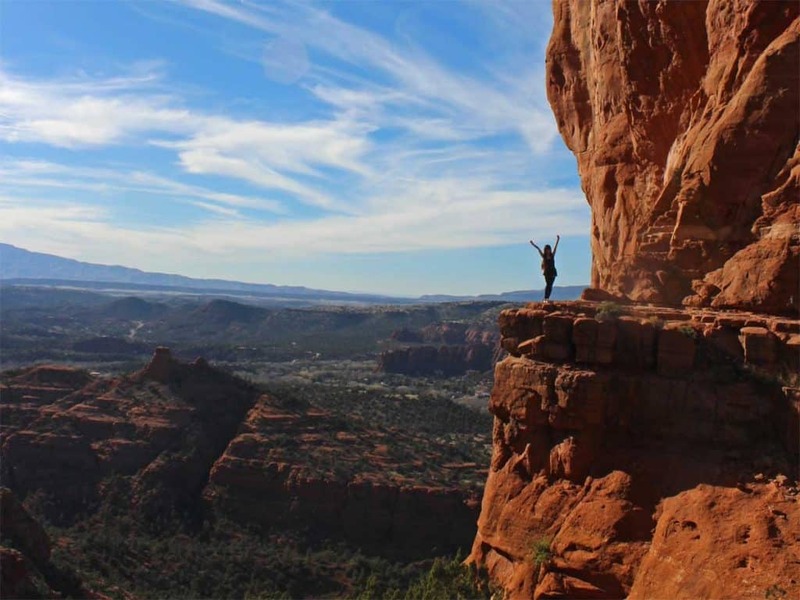 Before you lace up your boots and grab your backpack, familiarize yourself with these need-to-know, Sedona-specific tips. Sedona can get extremely hot, upwards of 100 degrees, but since it’s not humid, it’s not easy to tell when you’re getting dehydrated. Pack plenty of water and make sure to drink regularly while hiking, even if you don’t feel particularly thirsty. A water bottle is okay for a short hike, but to keep your hands free and carry more than enough water with you, consider a hydration backpack. You may not think of Sedona as being prone to storms – it’s the desert, after all! – but it does see a good amount of rain and lightning, especially during the summer. You never want to hike if there’s a chance of a lightning storm, so always check the weather beforehand. If you’re on a trail when you notice lightning, get to safety as quickly as possible. 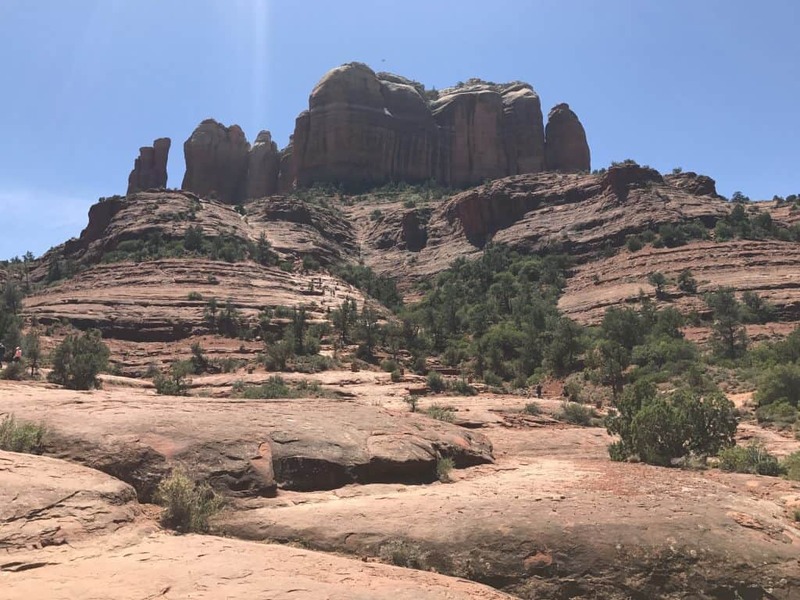 The weather in Sedona can get very hot, and even though it’s dry (which may not make you sweat as much as humid weather), you’ll still want to avoid the hottest part of the day, especially during the summer months. Hike either early in the morning or in the evening before sunset to avoid the heat. While you can probably be safe on a short, easy hike any time of the day, this is a good rule of thumb to follow if your hike is difficult or long. 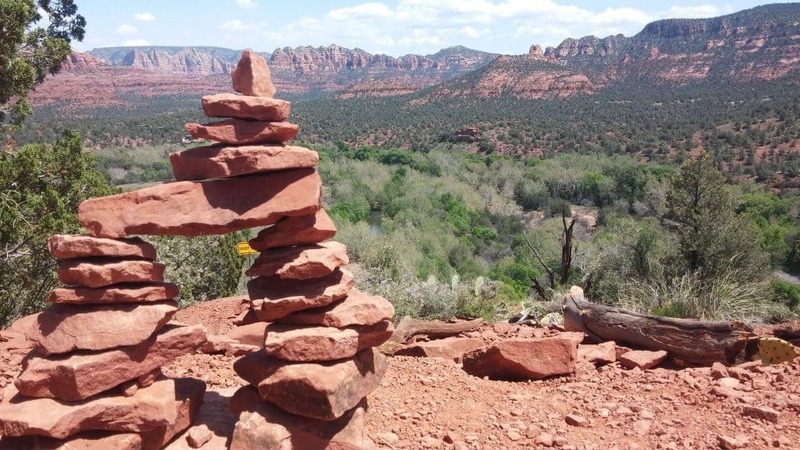 Like most trails in the U.S., Sedona’s hiking trails have a “leave no trace” policy, which means that you need to carry out whatever you carry in with you. For example, if you eat lunch mid-hike, you can’t leave behind garbage, like scraps of food or napkins. Either dispose of garbage in a trash can or carry it out with you. Leaving any type of waste behind can harm the flora and fauna of a natural area. While this is a good rule to follow no matter where you’re hiking, many of Sedona’s trails have unmarked side hikes you may be tempted to take. Always make sure somebody knows where you are, which trails you plan to take and when you should return. You may also want to use the HikerAlert app, which will alert your emergency contacts if you don’t return from your hike when you expect to. Not only is the sun extra strong in the desert, but it also reflects brightly off the red rocks, exposing you even more. Slather on SPF, wear sunglasses and a hat, and consider wearing hiking clothes with built-in SPF protection. Have you had a great hiking experience in Sedona? Tell us about it!